40th Anniversary tour and recording in 2017 !!!!! 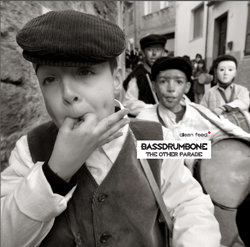 BassDrumBone is a trio that has wedded the uniquness of it's instrumentation with the singular personality of it's three members. A true collective, their music combines three distinct compositional and improvisational approaches with an exceptional musical rapport. 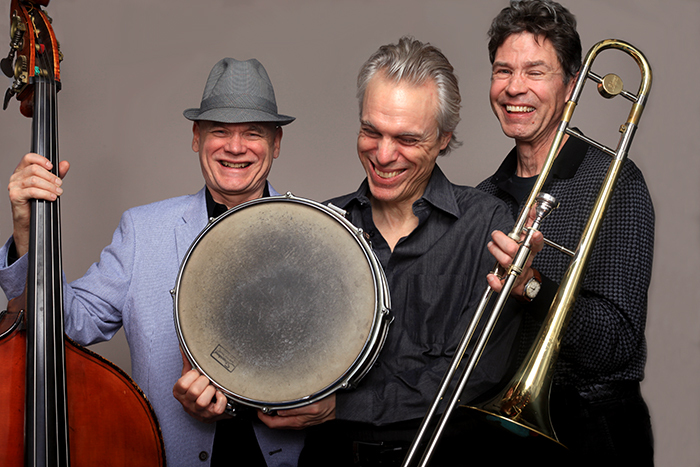 Mark Helias, Gerry Hemingway and Ray Anderson began performing as a trio in the fall of 1977. Their first record, "Oahspe", was released in 1979 on the Auricle Record label. Bob Rusch in his review of the record, wrote: "Exceptionally good music, fearlessly played and tightly coordinated. Recommended." After 1988 the group went into a temporary dormancy while all three of its members pursued their own individual groups. 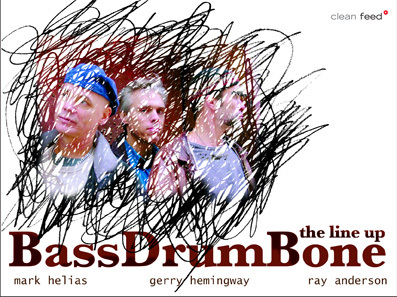 In the fall of 1993 BassDrumBone became active again for a tour in Europe. A tour in 1996 yielded "Hence the Reason"(enj9222) and in March of 1999 BDB released some archival material from 1986-97 on an Auricle Records cd entitled "Cooked to Perfection". BassDrumBone celebrated its 25th year together with the release of "March of Dimes" on the Dutch label Data. On the eve of our 30th anniversary, Clean Feed released "The Line Up". Followed by "The Other Parade" also on Clean Feed in 2009. And now on November 15, 2017 will come a very special double CD called "The Long Road" on Auricle Records (see here). The Other Parade was released (May 6, 2011) on Clean Feed Records. It was recorded in August 2009 in NYC and features nine new compositions commissioned by Chamber Music America's "New Works" Program on the occasion of our 30th anniversary. It is availiable from this site here, and you can hear examples of it at the bottom of the home page here. The story keeps unfolding for this fabled trio that released its first outing in 1978. With rest stops along the way, the musicians' synergy remains as a source of amazement, coupled with their perpetual creative sparks that sculpt a route embedded with fresh concepts and supreme musicianship. BassDrumBone pursues steamy New Orleans funk, vast modes of expressionism, and cunning improvisational dialogues. The artists whirl through linear unison lines and abide by an open-air musical forum via persuasive theme constructions. Variety is a predominant factor here. Yet they close the album on a simple and rather somber note during the title piece, "The Other Parade." Here, trombonist Ray Anderson's blustery notes and soul-searching lyricism is underscored with vocal attributes atop drummer Gerry Hemingway's punctuating backbeats and bassist Mark Helias' firm bottom-end. It's a dirge-like motif, where the band gradually raises the pitch to instill an impression of spiritual reckoning. The Line Up was recorded in April of 2005 and released on Clean Feed Records of Portugal in late October/early November of 2006. Review from Tom Sekowski. Review from AllAboutJazz - Troy Collins. The liners define BassDrumBone a "super team" and it's difficult proving the contrary, as Mark Helias (double bass & bass guitar), Gerry Hemingway (drums) and Ray Anderson (trombone) are three of the finest jazz musicians on the scene, their collaboration dating back from about 30 years ago. "The line up" comprises nine tracks that leave no time to back up from the flurries and combinations that these gentlemen bring to our ears. The most visible voice is naturally Anderson's, his trombone gauging the need of liberating jazz from the chains of irrelevance through a kind of phrasing that converges towards tonal centres and immediately flies away while remaining totally independent from poor-spirited gestural uselessness, his tone instead both effervescent and placatory. Helias is one of those bassists that play the line like the air would like to hear it, propelling the contrapuntal activities into the realms of field-day improvisation while remaining lyrically conscious at all times. Hemingway is the symbolic incarnation of the war that should be declared against the feeble-minded swingers who cause the idiots' heads in the clubs to cluelessly bounce up and down with their glass in hand; his playing is spectacular at times, fractured at the right moments, always able to shift the balance of the trio within the space of half a beat. An electrifying effort that captures at the first listening. Celebrating thirty-years as a trio project, this unit of estimable modern jazz artists has recorded for the Italian Soul Note record label and others since its inception in 1977. It's a veritable jazz super-group. Ray Anderson’s pumping trombone lines steer the way for a cavalcade of movements, consisting of tricky maneuvers and some hyper-mode frazzle and dazzle. And it’s easy to discern why the group’s lasted as long as it has: factor in the musicians' strikingly intuitive sensibilities, where strategies are re-engineered and refreshed in dynamic fashion. They successfully mingle very diverse elements into their overall game-plan. Bassist Mark Helias and drummer Gerry Hemingway engage in brisk rhythmic structures, and the unit enjoys ample soloing spots to counterbalance a foray of interloping exchanges. Think of a precision-machine with loose groove formats and a horde of improvisation-based retooling processes.